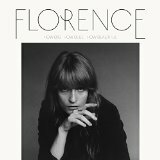 Today I am featuring Florence's new album! Woo! And I get to see her play at Bonnaroo this Sunday! I can't even wait! I am such a fan of hers, and I am really enjoying this new album! I had trouble picking my favorite tracks because I really like a lot of them! I adore Florence and I cannot believe that I missed that she got a new album out!! E really likes florence and the machine! how was it live at bonnaroo? ?